BSH components meet the needs of house-builders thanks to a dependable and safe building method. massive wood construction, timber frame construction, in combination with concrete/brick construction, in industrial construction as well as in modifications, alterations and extensions of existing buildings. easy assembly, even in hard-to-reach and narrow spaces, thanks to the possiblity of combining single standard components on-site. with proper protection and ventilation, moisture absorbed during construction penetrates BSH components up to 1 mm, thus preventing significant dimension changes. wood can absorb and return moisture, assuring optimal interior humidity. wood is characterized by very thermal conductivity compared to other construction materials. cuts, holes and indentations can be made on-site, with ease and precision. suspended ceilings are often used in industrial facilities in order to increase storage capacity. Due to their low height, BSH components are perfect for this purpose. indentations for wires can be made quickly and cheaply. durable component connections without high material costs and workload. BSH components are characterized by a positive energy balance! due to wood’s generally warm surface and low thermal conductivity, interior temperature can be lowered by several degrees. one layer can be omitted, because BSH components are dried to a maximum humidity of 12%. The components final forms correspond to the GK0 hazard class according to DIN 68800.
the joining grout for the ”double indentation – double feather” joint is compliant with the requirements of DIN 4102-4, Table 61, for ceilings up to F 60-B and Table 70, for roofs up to F 60-B. at night the accumulated heat energy is being emitted outside. possible to create a surface with noble appearance thanks to using selected, visual quality lamellae in visible areas. standardized components are available in our warehouses. The Złoty Kask emblem for the HBE house construction system during the BUD-GRYF 2010 Fair organized by the Polska Izba Przemysłowo - Handlowa Budownictwa. 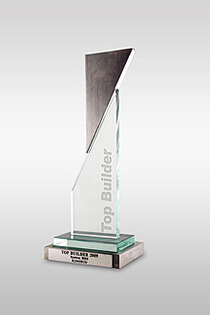 The Top Builder statue is awarded to high-quality brand products, innovative material, technological and construction solutions for building. 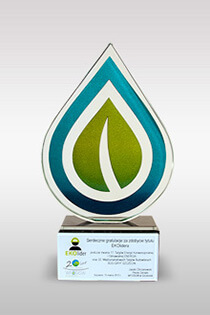 We were awarded the title of EKOlider during the 17th Conventional and Renewable Energy Fair ENERGIA and the 22nd International Construction Fair BUD-GRYF SZCZECIN 2013.